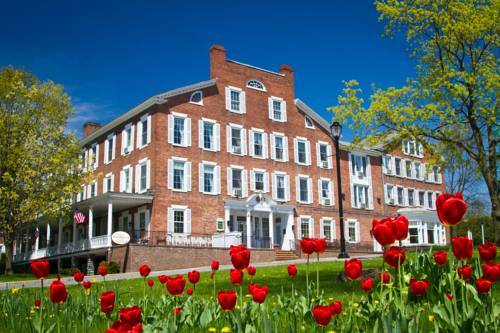 Since 1827 the historic Middlebury Inn has been welcoming guests from all over the world. With 70 beautifully and newly restored rooms and small town customer service the Middlebury Inn is known for its historic hospitality. Overlooking the village greens in the heart of Middlebury- Vermont we are the perfect hub for all your traveling needs throughout Vermont. We host individual travelers- families- corporate or group travelers and those visiting Middlebury College on business or pleasure. We offer full service dining options and superior banquet facilities for weddings- corporate meetings- family reunions and retreats. Come to the Green Mountain State and enjoy the personal service of a premier Vermont Country Inn. Our guests have come to expect such services as wireless Internet access- afternoon tea- and passes to the Vermont Sun Fitness Center. Our dining room serves breakfast everyday from 7AM to 10AM. Enjoy Middleburys unique boutiques just steps away- or a leisurely stroll to the Middlebury College Campus. Custom catering is available for special family- corporate- or leisure events. Our Chef uses fresh locally sourced food from dedicated small farmers and artisan cheese makers and specialty meat suppliers to prepare delicious dishes ranging from traditional New England fare to creative internationally inspired dishes. The Founders Room, Stewart Library and the Willard Room all open up into one magnificent Ballroom.